So here I am at CHA in the Hanna Booth. What an exciting experience. Meeting Kristi for the first time after numerous phone calls and emails. She is even nice in person than I ever imagined. We took several hours to set up the display and by the end of the day were ready to have a little R&R and some dinner. I was SO excited to be a part of Hanna's debut at CHA and to actually see all the new lines of Designer Paper to which I am So terribly terribly addicted!!! 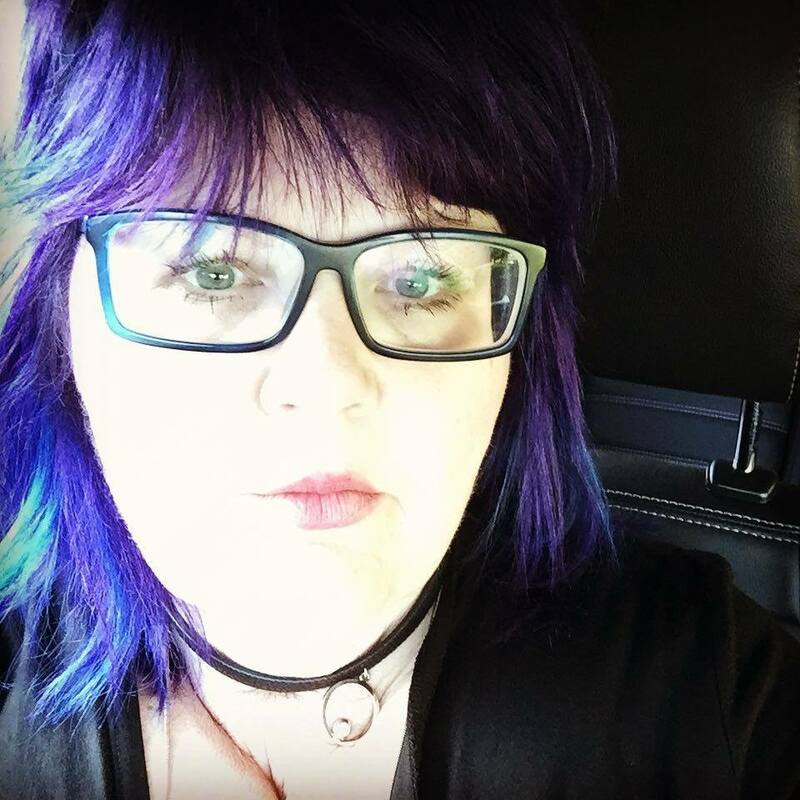 Here is our Beautiful Kristi herself. As wonderful on the inside.............caring, kind considerate and a great sense of humour! I am blessed to have her as a friend! What about this little chiquita??? This is the from the Imaginisce display, which was one of my Favourite Booths. Can't wait to get that Summer Penguin Paper!!! Here is Kristi, Leann and Lisa, two very talented members of the Hanna Stamps Design team and fun and lovely as well. I was just thrilled to meet them. Meeting Anna Wight was a delight!!!! Anna is one of my FAVOURITE stamp artists and a constant source of inspiration in my every day work!!!! Watching Trudee work magic with the Copic Markers was informative and interesting. You can find Trudee's beautiful creations in many of the current paper crafting magazines. We shared a booth and accommodation with Luann and Pearl. These ladies are wonderful and hilarious all wrapped in one package. I can't wait to meet up with them again!!!!! I will post a few more pictures in a bit.........................Jon and Tye, the science guys are in need of the computer!!!! Aren't Sundays supposed to be Relaxing??? I have this ideal image of Sunday being a rather lazy day..............leisurely, relaxing..........family time. Have you ever spent an ENTIRE weekend trying to assist two boys at the onset of adolescence with their Science Fair Project????? That I still have some hair left on my head is quite remarkable. I also wonder if there is a correlation between testosterone and the ability to listen and follow directions?? Now I did achieve an A- in Psychological Statistics, however I don't recall that this was covered in the course content. I am sure that I certainly would have tucked it away in some lobe of my brain for future use! They tell me they don't want or need help, so why is it that every 26 seconds or so or as soon as I pick up the phone, they are in DIRE need of assistance! After repeating myself 50 gazillion times or trying to obtain further information from the internet, I am told that all is cool! Well, everything except for myself. I am sure that my blood pressure, which is consistently normal has peaked several times since yesterday! In any case, their display board for the fair will look Fabulous............colour coordinated, die cut titles and the layout exceptional!!! They were rather impressed with my guidance to that degree. Now there is the matter of the Foxhole Radio.................it's all assembled now, but doesn't seem to be working..............................back to the drawing board!!! So let me escape for a moment from the insanity of science to bask in the bliss of art!!! It only took me about 6 hours to create this card and I am sure that my thighs and glutes have tightened up immensely from hopping up and down to tend to my little darlings!!!! So my next bright Idea was to take it outside to capture it's beauty (he eh) in the natural light..........well that didn't work so well. It is so damned windy out today the card kept blowing off the table, thus the dog eared corners..........blew right into the snowbank!! Thank goodness the glitter didn't smudge!!!! Well, I have to go..................the boys are beckoning again........................sigh. Maybe I'll relax next Sunday!! And so is the Hanna Springtime set. This Stamp set is chocked full of the sweetest images that you ever did see!! From precious little lamb, to the bunnies, baskets, eggs and fencing, the possibilities are endless when creating with this set. Notice the texture in the little lamb? I used flocking to give him a furry little finish!!!! The basket, eggs and lamb are mounted on dimensionals, while the dress is paper pieced. The photo really doesn't reflect this, but in real life, the grass looks dewy because I used some stickles on it. 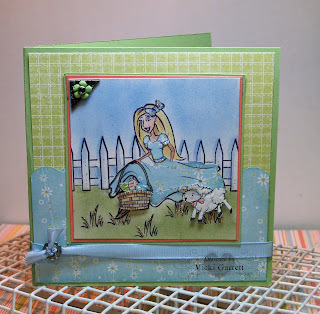 You can purchase this sweet springtime set along with motorcycle Hanna as of today over at Hanna Stamps. Just follow the link to the Hanna icon on my sidebar. Also check out the other designers fine cards!!!!! I plan to get some pictures of CHA up on this site this weekend. Kristi is releasing this set on Friday!!!! I could hardly wait to get this motorcycle set. 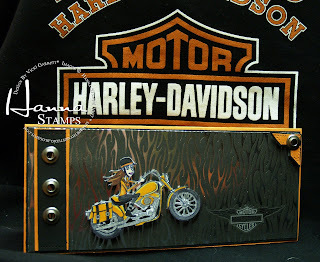 I love Harley Davidson and just had that flaming paper waiting for the right card!!!!! 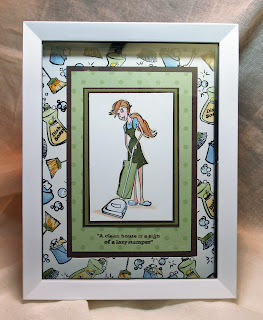 Love this Hanna as much as I do, head on over to Hanna stamps!!! And yes, I rode in from California last Friday. I have had so many things on the go, that I just hadn't gotten to it until tonight. Now I am staying up WAY past my bedtime to post, so I'll have to keep it short and sweet!!! CHA was a BLAST....................I want to tell you about it, but am way too sleepy tonight. I will be posting the deets soon!!!!!!!! I am SO excited................incredibly, terribly, wonderfully, joyfully THRILLED to be heading of to CHA in Anaheim with Hanna, Riley and Kristi of course. 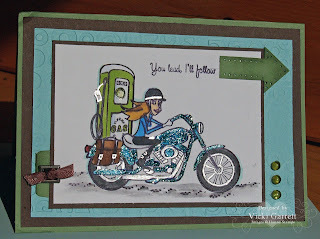 I have dreamed of going to CHA for years as have many of my scrapping and stamping pals.....................so just pinch me once to make sure that I am not dreaming. I can't wait to meet many of the Hanna Design Team as well as some of the stamp artists who have greatly inspired me over the past several years. I am not sure if I will get to a computer to post all the new and exciting news, but I will sure to share lots of pictures and scoop when I return. 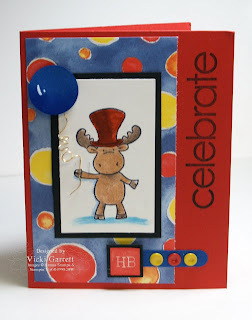 his little card was fashioned from the Beer Drinkin' Irish Riley Moose Stamp. I used masking to eliminate his mug as well as the clover on his hat. In order to do this, I essentially taped over the clover (hmmm over the clover...........sounds like a good Irish song!) and his glass while inking up and removed the tape prior to putting the image to paper. The Moose was coloured with SU! Watercolor Wonder Crayons and Aquapainters. The Sweet Designer Paper comes from the Provocraft Kids Pack. I LOVE 6x6 paper.............great for cardmaking. In order to create the Balloon, I used the 1.25 circle punch and shaded around the edges of the circle with Brilliant Blue ink in order to give it more dimension. I mounted the Balloon on a foam dimensional and curled wire for the Balloon String. Snaps in Primary Colours and Sentiment Stamps from Stampin' Up! complete this fun Birthday Card. If I don't see you before the 15th of February it means that I am taking a walk on a warm beach somewhere and taking in all the Sizzling sights at CHA!!!! Well, not me actually..........my internet service. I lost my connection on Wednesday when we had the huge windstorm. The Service Provider kindly came to my rescue on Thursday, however by early Friday, with an additional storm front moving in, the access was short lived!!! I MISSED the release of the New Hanna and Riley sets and I missed posting what was supposed to be a sneak preview of the Domestic Goddess Set. So here she is in all her glory in shades of Brown and Olive to match the walls in my Stamping Palace!!! I found this cool frame at the Dollar Store. It is very neat because it is a shadow box type frame, so if I had chose to all bulk to my layout, the box would have adapted to it. Instead, I kind of liked the plain layout, given the "business" of the Handstamped Photo Mat. Brooms, Scrub brushes, Detergent and Bubbles round out this sweet set, available on Hanna Stamps!!! !